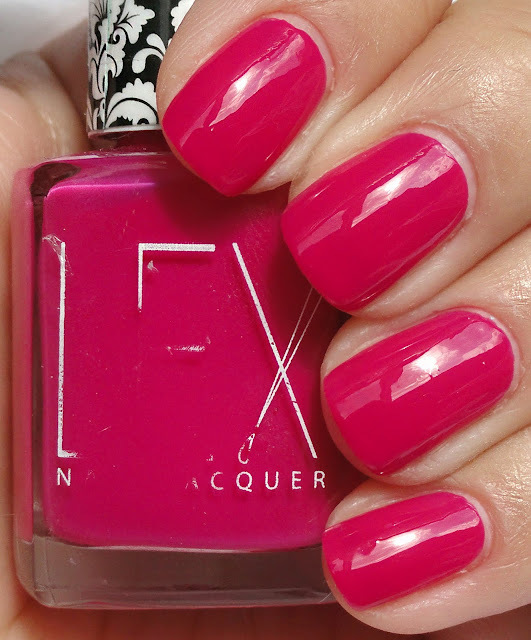 Lex Cosmetics is run by Lex a twenty-something make-up lover who wanted a particular color of nail polish she couldn't quite find. So she made her own! Lex wanted women to be involved in the creation process with her nail polish company so all the colors that are produced come from an idea by a consumer. Uhh, could this be the best idea ever?! We all go crazy over custom colors, like Rescue Beauty Lounge's recent fan collection and lots of us "franken" our own polish colors when we can't find exactly what we're looking for. Lex Cosmetics also lets the polish designer choose a charity foundation to donate a $1 of the proceeds to, which is amazing. I love reading the "color stories" of the polish colors Lex has on her site, they're interesting and inspiring. Every so often she has a vote to determine what the next color she makes will be, you can see the polish ideas that are in the running on her website. "I chose the name because it reminds me of what you're wearing when hanging in on a weekend with your boyfriend, watching movies and making breakfast in bed... hence 'Toast'! I like it too because its casually elegant - perfect for everything from a job interview to a first date and it's great to compliment bright spring colors because it's neutral." - $1 from each purchase of Toast goes to Habitat for Humanity. "Sassy Pants is the color to get a girl up and moving. I hope it inspires women to let their sassy selves out." - $1 from each Sassy Pants purchase is donated to Girls on the Run. I got these to review but will definitely be purchasing some colors from Lex Cosmetics soon. I really love the charity aspect of this company, it makes me feel great helping people and getting a quality nail polish at the same time is a win-win. You can get Lex polishes from www.LexCosmetics.com for $10 each.